Small town offers surprisingly unique downtown for visitors, from food to antiques to a riverside experience, Littleton continues to grow in 2016. Chutters on Main St in LIttleton, NH. Featured in Yankee Magazine’s “Could You Live Here?” published July 2015, Littleton, New Hampshire has received many awards and public recognition for its vibrant culture, bustling Main Street, and historic downtown. Littleton has been named “One of America’s Best Small Towns” by Outside Magazine, “One of America’s Best Main Streets” by Huffington Post and “Quintessential Small Town” by NBC Nightly News with Lester Holt during NBC’s primary season visit to Littleton, New Hampshire. 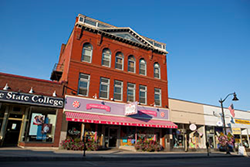 Downtown Littleton is speckled with historic buildings, exciting and unique shops and a variety of family-friendly attractions. Main Street has seen a rejuvenation of its historic downtown with recently completed improvements to its riverfront over the past few years. Littleton is known as the economic hub of northern New Hampshire. Many of the mills from the early settlement of the town have been converted into alternative uses that benefit the present day community and visitors to the area. The surprisingly unique identity of Littleton, New Hampshire has been captured by many other of its local shops and eateries. “We are happy to be a part of Littleton and its growing revitalization. It’s been great to see other small businesses that are putting down roots within the community who are also excited to be active members in the community” says Jim Alden, owner of Chutters candy store. On Main Street, visitors will find Chutters, which holds the Guinness Book of World Records for the World’s Longest Candy Counter, stretching 112 feet. Some visitors have discovered the town of Littleton after searching for this sweet gem. Chutters candy counter is showered with an abundance of sweets, chocolates and homemade fudge. Oh, and during the election season, Chutters was the place to be to meet all of the candidates vying for votes. Please visit http://www.chutters.com to find out more information. While Littleton, New Hampshire is the home of Pollyanna, written by Eleanor H. Porter, and once held premiers and birthday parties for second home local Bette Davis, the town has been receiving awards and recognition steadily over the last few years due to its growing popularity of its fun and surprisingly charming blend of new and old. From the downtown cafes and shops, to the riverfront dining and outdoor adventures, visitors are sure to find something that makes Littleton, New Hampshire one of America’s best Main Streets, and a destination for any White Mountains visitor.